Would also like to buy two Thranta Trophy decorations (130 coins each, 260 total). I don't have a link though because TOR Decorating seems to be down right now. I also have more credits available for trading in my legacy bank now, and i'm still looking for the above armour set. edit: no longer for sale on the CM I think. Zayne Carrick's armour set is up for sale on the CM right now, i've been looking for it for a while so I guess i'll buy one of those too if anyone has the coins. Would like to buy the Mandalore the Indomitable chestpiece and leggings for a sithy outfit I just thought of. Can't afford the full GTN price (~12 million for both) tho right now, at best I can do half of that plus some items. edit: The price for both just dropped to 4.5 million, i'll pay that for sure if someone buys it! edit again: nope the price went back up, RIP my dreams. still interested if someone finds one for cheap tho, I need to get my Krath death witch style perfected lol. edit: obtained the armour! need more dyes tho. The new Esne Fanatic's set is really nice, if anyone gets an extra chestplate from packs i'd be willing to buy it! Also the helmet too. Also looking for a Wayward Warrior dye from the same pack, because I like the slightly blue tint of its primary colour a lot more than pure black. The first three are the most important and i'd like to get as many of them as possible. The rest I only need one of, more would be nice but it's far from essential. So they've stopped naming them dark red/deep blue as much? Interesting... I'll keep an eye out! Yeah they seem to be doing fancy names now for dyes instead of just plain colours. I like it. Am looking to buy Vectron Raptors. I think I need two. Not super high priority, but in case anyone gets an extra one i'll buy it. 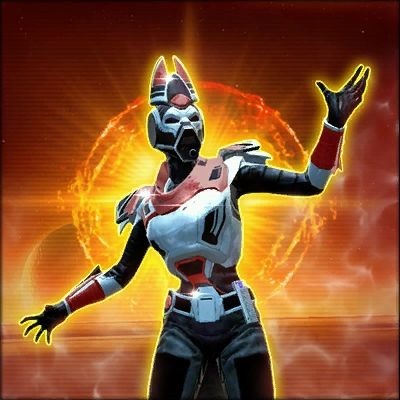 Would like to buy a P3-KP droid companion for my commando. Current GTN price is 4.9 million, which is actually quite decent, though if someone has one they're willing to sell for less i'll certainly take it. edit: I have obtained both of these now, thanks Seraphie! There's a Classic Despot's Chest Plate on the GTN for 950k right now, if someone can buy that quickly i'll pay them back. Also the P3-KP droid price went down a little bit, so same deal for that. There's a small sale on cartel market decorations right now. It's not much, only 10% off, but I was looking to buy some anyway so here is a list in case anyone has some extra cartel coins. Most of these are less than 100 coins each even without a sale. Luxury Wall Sconce - As many as I can get tbh, at least 4 tho. edit: I got the Reaver set, thanks Seraphie! I'd like to buy the Reaver chestplate or the Exposed Extrovert chestplate. The Reaver one would be preferred but I can work with either, they're both way too expensive anyway lol. I would like to buy three Mark I customizations (the Imperial-looking ones) for the Annihilator T4-1D companion. They cost 10 jawa junk each from the companion customization vendor in the cartel bazaar. Will gladly take more than three as well, I don't need more but it would be nice to have that bit of extra variety in companions for my Sith instead of just having a ton of nexu lol.